How important are bonuses to % burn damage vs. other things? What sort of itemization should I be prioritizing? Fire damage sure is important but main damage/killing power comes from stacking Burn damage through difference sources and procs. Based on my experience you can easily beat HC Challanger with less than optimized gear but with couple key items and myhtical ones at that ofc. Since Gladiator is the pinnacle challange to beat, you'll need pretty much the advised gear with above average rolls considering it is also HC. Just to show you this is what my Cadence tooltip looks like, just with the buffs off fight without any procs. There is no limitation like that , i didn't have access to the extra spawns at the time since it was my first run in Gladiator with the Cadence setup. Just saw your edit now, i updated the build and explained how you sustain yourself and leech life. Last edited by Pyroscar; 10-31-2017 at 04:31 PM. Sure, but I'm just trying to figure out where the damage is coming from. Cadence doesn't leave a burn outside the one on the weapon, correct? So point for points, assuming you aren't having to make bad trades focusing on burning damage is better than fire? Or is the burn damage on the weapon modified by %WPN damage? Last edited by Ceveth; 10-31-2017 at 04:47 PM. You have Cadence which is to apply our flat Burn damage through %WPN and leech life as you guessed correctly. Rest of skills are; Thermite Mines and you really have to use that a lot, quite important one. Blazing Charge, chunky Burn dot on Vindictive Flame thanks to Mythical IB and transmuted BWC in my current setup. 4 offensive devotion procs : Elemental Storm, Flame Torrent, Fissure, Meteor Shower. You can't really seperate Fire damage from Burn, sources you aim provide you both with slightly in favor of Fire. It is not uncommon to pass on some Burn damage options when focusing on flat Fire damage in several builds but we take every possible bonus to both in this one. Stacking Burn damage gives that edge and enables kiting compared to flat Fire, if i didn't aim for Burn damage my weapon would have been quite different. And i don't think it could have worked as good as this setup, despite the build being tanky and all it is still not possible to tank everything head on in Gladiator especially as a non shield build. Last edited by Pyroscar; 10-31-2017 at 05:23 PM. Thoughts on Seal of Blades? 5% ADCtH & procs one of our devotions constantly (Flame Torrent, specifically). Also Toad instead of Quill grants you another 3% ADCtH at the cost of 2% DA. Seems like a decent trade? Last edited by Ceveth; 10-31-2017 at 06:27 PM. Nice build, a friend plays something similar though he went with Fire Strike, I agree with Cadence being better (sad but true). The weapon is a good choice for burn focus. Have you tried with ulzuin set? I presented 2 different builds with different setups, you can chose whichever you like or which ones items you drop faster. Both builds are more than capable of completing HC Gladiator with extra spawns. I thought you could tell the difference in weapon choices, one of them is a 2H and other is a 1H since BWC focused one uses a shield. - new devotions including phoenix and magi for extra damage. Phoenix damage absorption coupled with huge armor (3k) and 98% Armor absorption allows to ignore trashes completly and focuses on big targets. 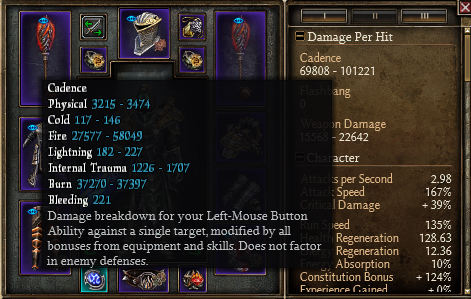 - replaced seal of destruction by seal of blades, reason is we lose a bit of fire/burning/crit damage but we gain pierce res, ADCTH and also a proc for devotions. Plus the spell given by seal of destruction is useless here. Extra adcth from SoB allows us to get rid of one lifegiver signet and take combustion band, compensates the loss of burning and fire damage from SoD, but also add a fire proc + 10 fire resistance reduction. - also replaced pants by chausses of barbaros for the proc. - boots are MI but kinda easy to get if you craft a bit. Tried 2 times gladiator cruci with extra spawn without any buffs and died at 150 because of insane wave (2 iron maiden and fabius, yeah f*** you too game). This char is godly for farming MC because of movement speed + 2 dashes. Procs kill trash and you don't have to hit them ^^. NB : Tried ruby and sapphire of elemental balance. You lose lot of Hp, ADCTH and the proc isn't that good (half of it is useless because cold damage). Tried 2x Mythical Reign of Fire and Ice. Same thing, it's cute but it adds nothing to the build. Last edited by Gavija; 11-08-2017 at 11:59 AM. build is pretty awesome but think of another rings. What do you say about Mythical Closed Fist Of Vengeance and second one Mythical Open Hand Of Mercy?